Although detailed statistics are not kept on daily activity, generally there are around 20 volcanoes actively erupting at any particular time. 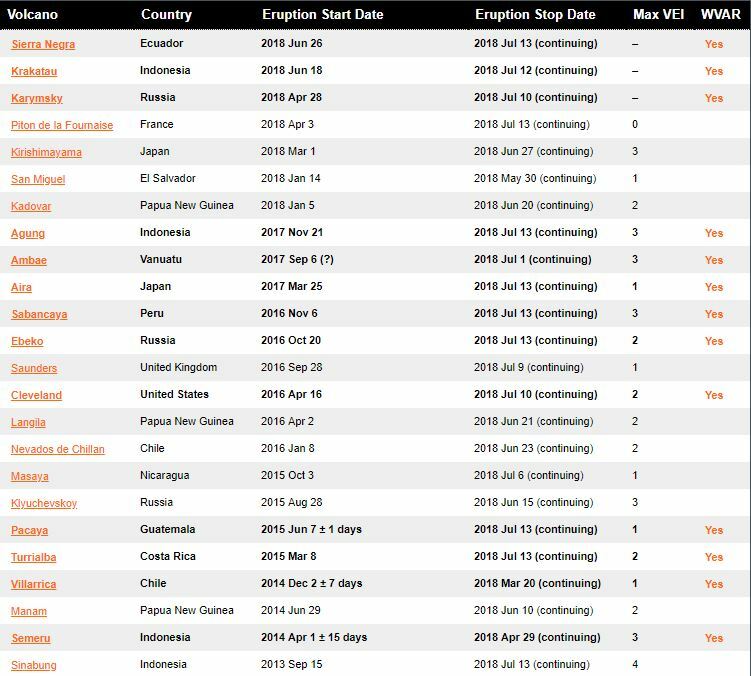 Last week, the Smithsonian / USGS Weekly Volcanic Activity Report (WVAR) reported 22 actively erupting volcanoes and 43 continuous erupting volcanoes. We are in a phase of increased volcanic activity. 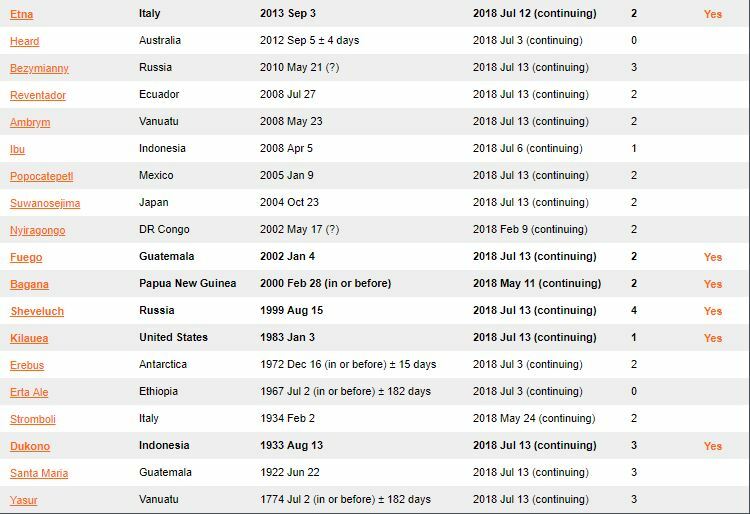 Overall there are 43 volcanoes with ongoing eruptions as of the Stop Dates indicated (July 24, 2018), sorted with the most recently started eruption at the top. The Smithsonian / USGS Weekly Volcanic Activity Report (WVAR) for the week ending on 24 July 2018 includes the 22 volcanoes bolded. 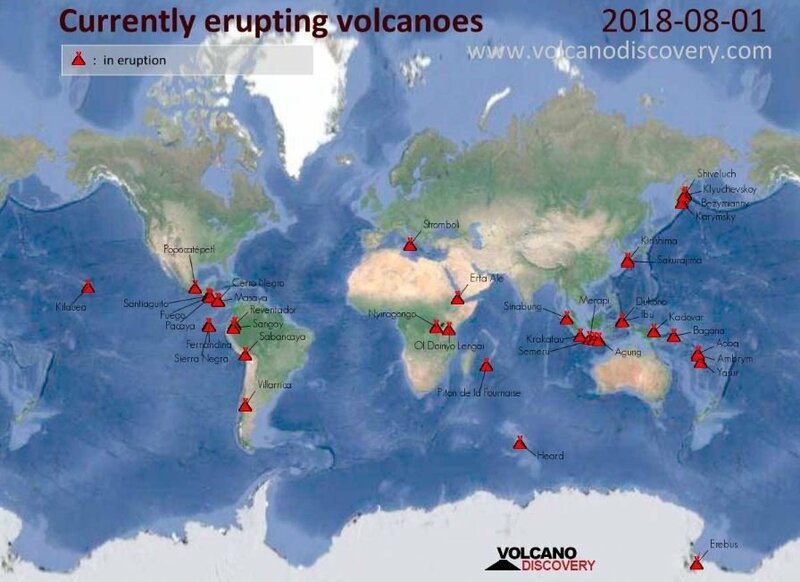 Overall there are 43 volcanoes with ongoing eruptions as of July 24, 2018, sorted with the most recently started eruption at the top. 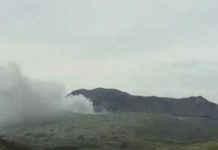 An eruption marked as “continuing” does not always mean that the activity is continuous or happening today, but that there have been at least some intermittent eruptive events at that volcano without a break of at least 3 months since it started. 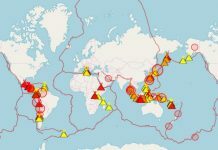 An eruption listed here also might have ended since the last public data update, or at the update time a firm end date had not yet been determined due to potential renewed activity. Our Earth is releasing fire around the world. It could happen right next to you. Be prepared and get ready! Stop the video above at 0:45, you can see a house completely burnt down to ash between 2 intact houses. Only targeted houses were burnt down. What kind of people own those burnt down houses? I have answer for you. There is a reptilian militia group around here. I can show you where they are practicing shooting, and their shooting targets are all humans. Beside a dam, there is “Keswick Dam Shooting Area”. I bet all these human disguising Reptilian militias’ houses were all burnt down to ash. I bet most of the owners, who own these burnt down houses, belong to some kind of churches. They do not realize that they are worshiping Lucifer instead of God. Most of churches’ worshiping God is Lucifer. I have to tell you that God loves humans and some other animals at the same level. Humans and reptilians think they are the top of the food chain. They are taught animals are there for you to eat. But this is NOT true. God loves every living being equally. If you BBQ on BBQ grill, you are sacrificing those meat for devils. Devils love the smell of cooking meat; therefore, Gods in the Old Testament are all Devils = Reptilian Cannibal Aliens. On the Earth, there are so many areas named “Devils” something like Devils Canyon, Devils mountains, Devils picnic ground, Devils campground…. You can easily find those places on Google Map. The Earth is used to be a Devils playground, but right now, Galactic Federation of Light is here to destroy all the Devils Secret Underground Bases on the Earth. There is no explanation of the color on those structure, but easily suspect Red structures are completely burnt down, Yellow structures are damaged structures, and Green structures are intact structures. I’ve found “Slaughterhouse Gulch” in north side of French Gulch. Above north this area, all houses were burnt down. We can easily imagine those houses belong to Cannibal Reptilians living under “Slaughterhouse Gulch”. I guess so many human children camping these area were taken by them to be slaughtered and eaten. Those reptilians suggest those human sacrifice and ritual places ( just like their human meat buffet) by naming. Around my area, there is a place “Bloody Spring”. In that area, there are only a couple of buildings belong to Cannibal Reptilians. Near “Bloody Spring”, there is a huge quarry (=Entrance and Construction site of Reptilian Secret Underground Base). In Huntsville Alabama, there is a major busy road beside a hill with their secret underground base, named “Slaughter Road”. I am sure you can find this kind of places in your area, too. I’ve found a huge Reptilian mansion with a swimming pool and a Helipad. This mansion has been burnt down, but a mansion in front of this burnt mansion has not been burnt down. This mansion has been burnt down. Can you imagine if you can input any digits you want into your bank account to have tens of millions of money? If you were such as privileged reptilian, you can do that. Then imagine what kind of things you can get? With countless money, you can buy a mansion like this one, you can buy any kind of luxurious cars, you can hire many pretty young maids to clean your house and do your favors. This is privileged Reptilians’ every day life. Flood in India? In these days, India have been experience of Monsoon flood. Many cars submerged under the water. This kind of scene become every day life. The extreme weather become a New-Normal! A street becomes a swimming pool. This truck has been used for something bad. Many RVs’ owned by Rich Reptilians were burnt down. If you Google “RV fire”, you can find many videos. Who can afford $100,000 ~ $500, 000 RVs? Those privileged Reptilians can have them all! They can created money as much as they want out of thin air. But money they created is used to enslave humans. They teach you “Only hard working people can get money.” But it is not true. Money they create is completely FAKE, FAKE money just like toy money in Dollar Store. And you are working hard to get those toy money Reptilians can create. Employment = Enslavement. This happened on our Earth!!! 29-31 July 2018 Weather Extreme!!! How many volcanoes erupt every day? The Smithsonian Institution has the Global Volcanism Network and a monthly bulletin about eruptions. About 50 to 60 eruptions happen each month. Some volcanoes are in constant activity — Stromboli, Kilauea, or Sakurajima, for example. 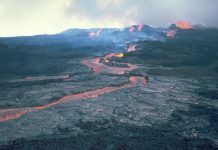 There are many examples of volcanoes which show some sign of renewed danger and then erupt within an hour, though more commonly, within one day. Most eruptions last hours but some continue for weeks and months. How many volcanoes can erupt at once? At any given time, about 10-20 volcanoes are erupting on average, and it could be imagined that this number sometimes peaks to about 30-50 erupting volcanoes (on land). Many more than that is very unlikely. Including submarine volcanoes, these figure probably have to be multiplied by a factor of at least two or three, but much less is know about the activity of submarine volcanoes.